The Railway authorities have hit a major roadblock in the execution of the Bidar-Kalaburagi new railway line while drilling for a 1.5-km-long tunnel near Margutti village at the border of Kalaburagi and Bidar districts. 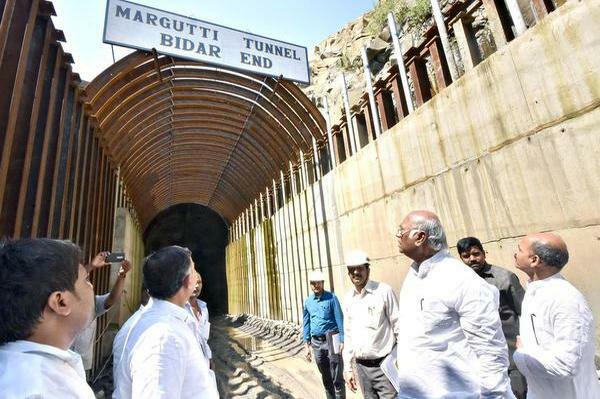 Senior officials of the South Central Railways, led by General Manager Ravindra Gupta, explained the problem and how it was being tackled to the former Railway Minister and Leader of the Congress in the Lok Sabha M. Mallikarjun Kharge during the latter’s visit to the Margutti tunnel on Sunday. Mr. Gupta said that at the end of the tunnel on the Kalaburagi side, the Railway authorities came across a serious problem. Mr. Kharge and district in-charge Minister Sharanprakash Patil, who drove through ankle deep water inside the tunnel for more than 1.3 km, interacted with the workers involved in the drilling and strengthening of the soft soil portion of the tunnel. Mr. Gupta said that the workers were working on 24 x 7 to complete the work within the stipulated time. Mr. Gupta said that the soft soil portion of the canal had a chimney kind of effect, with the soil, with huge boulders, collapsing. Added to this, heavy rain had flooded the tunnel, hampering the progress of the work. There was also heavy seepage at different points. He said that at the soft soil portion, steel support frames and concrete linings were fixed to ensure that there was no danger to the tunnel. To arrest the seepage, high grouting using the Super Fine Cement was also being taken up. The cost escalation as a result of this work was around 20 per cent, which was not high, Mr. Gupta added. He said that despite all these difficulties, the Railways would complete the drilling and strengthening of the canal by December 15 this year as scheduled and complete the track work by March next, facilitating the Commissioner for Railway Safety to conduct inspection of the track and certify it for movement of trains in the first or second week of March 2017. Expressing satisfaction with the work, Mr. Kharge complimented the Railways and the men working to complete the project as scheduled. The new line would reduce travelling time to Mumbai and New Delhi by at least two hours. Mr. Kharge said that he would also ask the State government to release Rs. 180 crore as its share in the project at the earliest. Regional Commissioner Amlan Aditya Biswas and Deputy Commissioner Ujwalkumar Ghosh were present.